Have fun with Tabletop games! This is a full day of tabletop gaming goodness! There will often be scheduled events (see below) but there will always be a great opportunity for Open Gaming all day with our growing game library available. You are also welcome to bring along any games of your own that you would like to play with new friends. Entry fee is included in monthly $5 membership. fighting to survive in a world beset by magic and evil! This game will explore a fun take on the classic ‘Kidnapped Princess’ theme. The game will be for 8th level characters; pregenerated characters will be provided. Ronnie, a homeless woman, prostitute and heroin addict, has been found by the St. Louis Police Dept. horribly cut up and dead, presumably at the hands of the Street Phantom, a mysterious serial killer who calls himself “Mr. Glass”. This monster seems to have a propensity for slaying members of the homeless community who have been visited by another mysterious entity known as “The Angel of Mercy”. Who are these people, if people they are? And is there a connection between them and the sightings and attacks purported to be by an “Urban Werewolf”? And how does a clueless cabal known as Satan’s Chosen Temple fit into the picture? Now Pat, a homeless Veteran, has become the latest victim of this “Werewolf”, terribly ripped up within shouting distance of our investigators. Though apparently wounded and driven off, the Werewolf has fled and the pursuit is on. For those interested, it’s not too late. I still have several pre-generated character slots open. All members of WIT, the Whispers Reality TV show Investigative Team, investigating the supernatural. Experience the mystery and horror of the Occult Underground. Experience Unknown Armies. 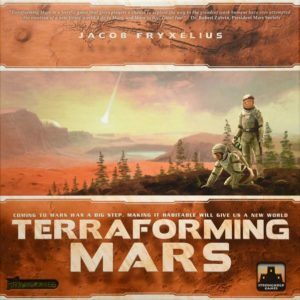 In Terraforming Mars, you play one of many those corporations and work together in the terraforming process, but compete for getting victory points that are awarded not only for your contribution to the terraforming, but also for advancing human infrastructure throughout the solar system, and doing other commendable things. The Prelude and Colonies expansions are available to be included if players are interested in trying them. Later Session: 4 pm….ish – 10 p.m.
Federation Commander is a fast-moving game of starship combat in the Star Fleet Universe. Depending on the number of players, there are a variety of scenarios we can choose from. X-Wing has become a popular game at 2 Flights Up. 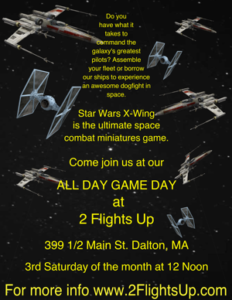 All Star Wars fans are welcome to come. We are happy to accommodate new players. Either bring your own fleet or just come and we’ll assemble a fleet for you with our ships. This miniatures game is great for ages 16 and up. Ask Thomas about it!